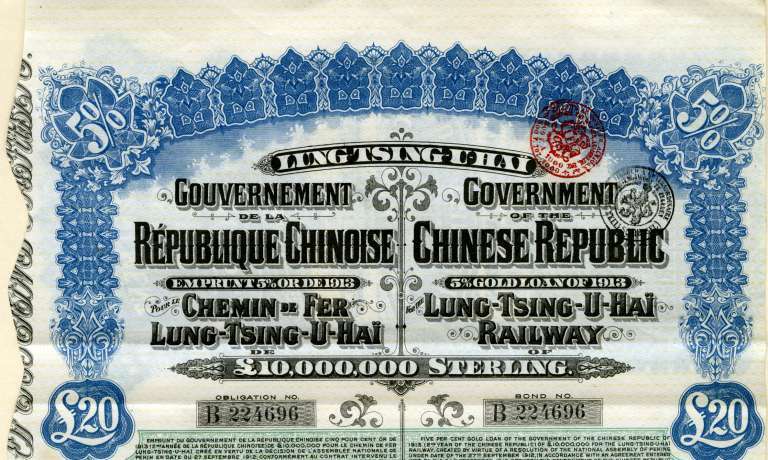 Beautifully engraved certificate from the Government of the Chinese Republic Lung-Tsing-U-Hai Railway issued in 1913. This historic document has an ornate border around it and a vignette of the bond's name in French and English. This item has the printed signatures of the Officers and is over 90 years old. No coupons. The purpose of the Lung-Tsing-U-Hai Railway Loan was for the construction of the Kansuh to Sea Railway (Lung-Tsing-U-Hai ) between Lanchow-fu and Haichow. The proceeds we also used for the redemption of the Pien Lo Railway Loans of 1905 and 1907, development and improvement of the Haichow port, payment of interest due on the loan, and for working expenses during the period of construction. The loan was secured by the railway revenues, and was a direct obligation of the government.